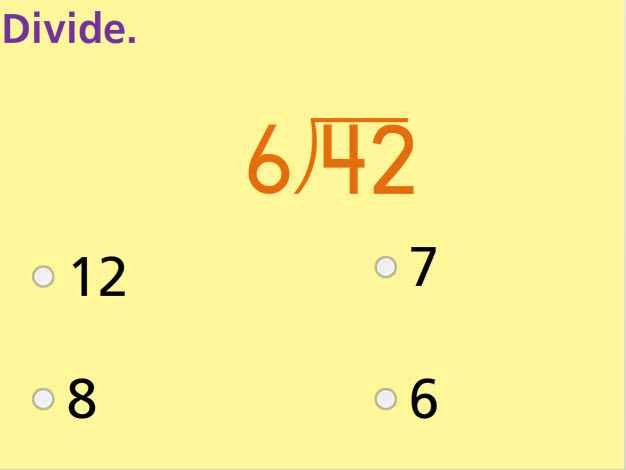 Divide whole numbers in this online math test to show how well the student understands basic division facts, especially dividing by numbers up to 12. This test has seven multiple choice questions and three drag-and-drop activities. The student must divide one, two, and three-digit numbers by numbers up to 12. Return from this Division Facts Math Test to the Elementary Math Tests, 5th Grade Math Tests webpage, or to Math Tests.